The Syrian president had suggested to U.S. officials a willingness to break his military alliance with Tehran, forge peace with Israel and diminish Syrian support for the militant groups Hezbollah and Hamas. The White House put in place a foreign-policy team with vast experience dealing with Mr. Assad and his late father, President Hafez al-Assad. And in Mr. Kerry, chairman of the Senate Foreign Relations Committee, the White House found a key ally in pursuing Mr. Assad: In repeated trips to Damascus, the Massachusetts Democrat had established something approaching a friendship with Mr. Assad. “He probably has the wherewithal to be sitting in the palace for quite some time,” said a senior administration official. U.S. relations with Syria were at a low when Mr. Obama took office pledging to re-engage Damascus. The George W. Bush administration had accused Mr. Assad of facilitating the flow of al Qaeda fighters into Iraq … … President Obama’s early signals were mixed. 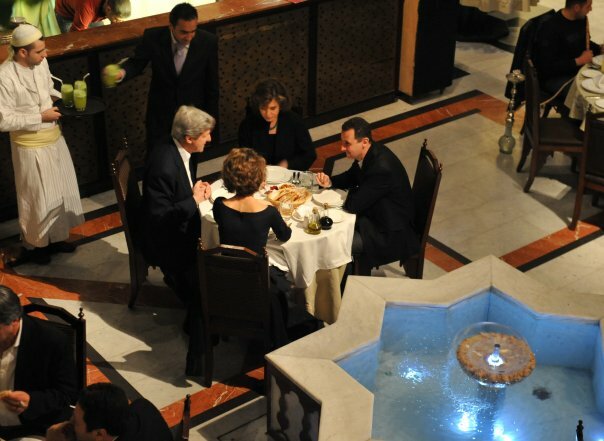 In March of 2009, Messrs. Kerry and Assad and their wives dined together in the ancient heart of Damascus, just down the street from where the head of John the Baptist is thought to be entombed. For hours the men talked bilateral relations and Mideast peace, forging a strong working relationship, according to Syrian officials and congressional aides. Mr. Kerry says he acted independently but coordinated the visit with the White House….